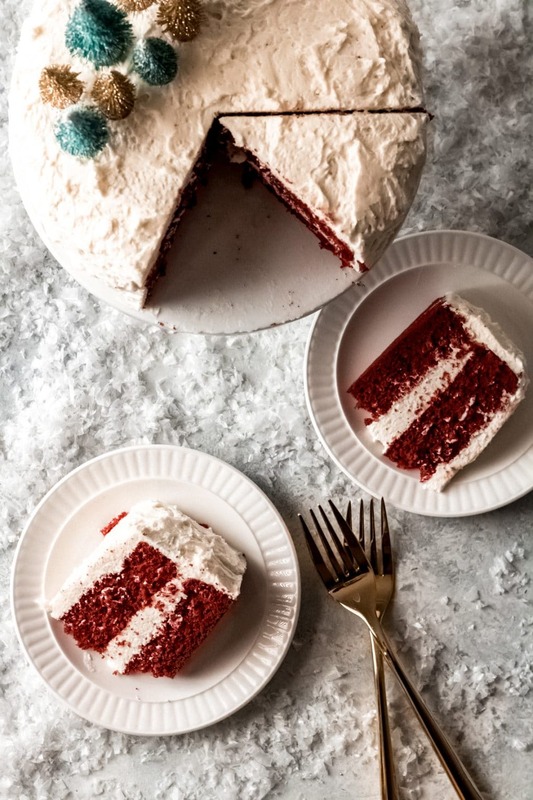 Dazzle your guests with a gorgeous red velvet layer cake with butter roux frosting. Known by many, however, it’s the butter roux or ermine frosting that sets this cake apart from it’s more commonly known cream cheese version. 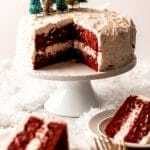 This red velvet cake with butter roux frosting is my birthday cake request every year. Except I never knew it was called butter roux frosting and I also never knew it wasn’t like the more well-known red velvet cake with cream cheese frosting. So you can imagine my horror when I first tried red velvet cake outside of the home to wonder who in the world ruined my cake with cream cheese frosting?!? To me, red velvet cake with butter roux frosting IS the only red velvet cake I’ve ever known. Now that my profession is cooking and food photography, I’ve realized that this cake, a treasured family heirloom, is known by another name, the Waldorf-Astoria Red Velvet Cake. With that being said, this cake is the only red velvet cake I’ve ever known, and will always be the only red velvet cake for me. 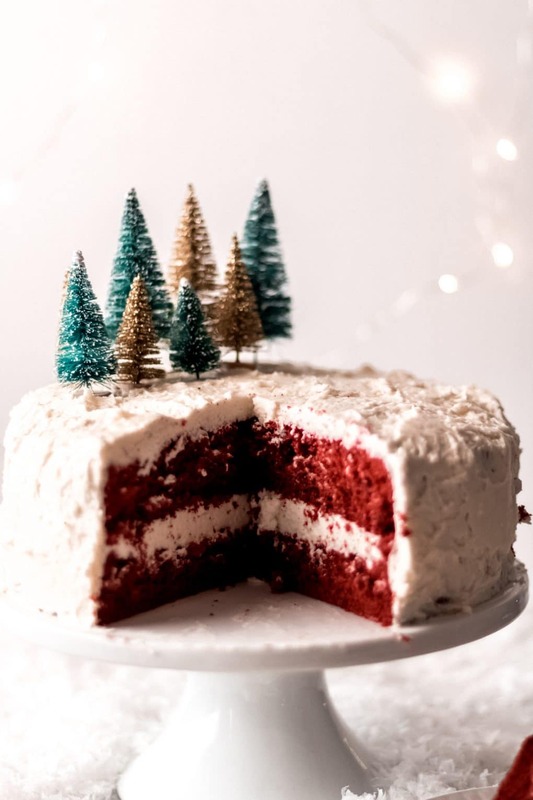 As a special gift to my readers, I wanted to share with you my favorite cake that I not only enjoy on my birthday every year but that I also like to serve around the holidays with its gorgeous red color. And, I’ve even included a shortcut for those that are intimidated by baking. 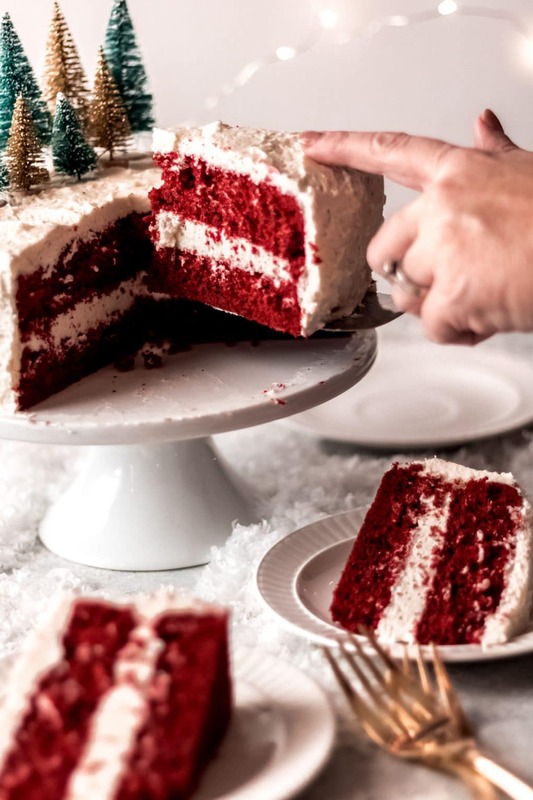 Contrary to popular belief, red velvet cake isn’t just chocolate cake with red food coloring. There’s a long history surrounding red velvet cake, and I’ll spare you the long version. However, the short of it is that the red coloring is a result of the chemical reaction between cocoa powder, vinegar, and buttermilk, all of which are ingredients in the traditional cake recipe. 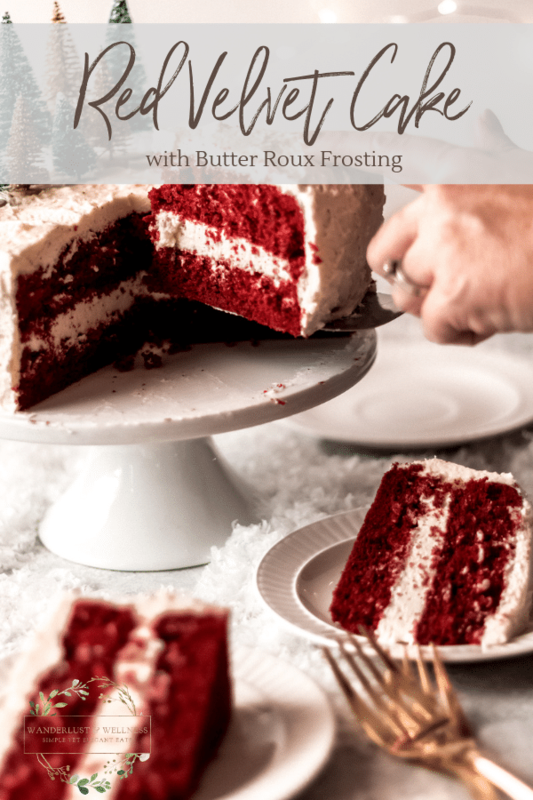 While my family heirloom recipe does have the traditional recipe using these ingredients, for this version I’m gifting you a shortcut and using the Duncan Hines Red Velvet cake box mix. You’re welcome. What is butter roux frosting? Never heard of butter roux frosting? Don’t worry, neither had I until I sat down to research what in the world this glorious icing was that I had eaten for so many years. Also known as ermine icing, or boiled-milk frosting, butter roux frosting consists of making a roux of milk and flour and then double-boiling it until it becomes custard-like. Then, it’s mixed with butter, sugar, and vanilla. It’s also best refrigerated as it’s mostly butter. You’ll never want to go back to cream cheese frosting on your red velvet cake again. 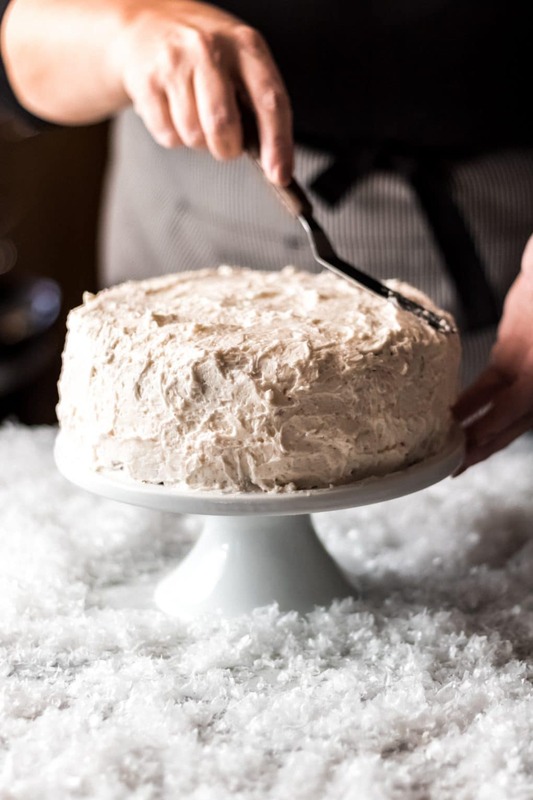 How do you frost a layer cake? You’ll bake two 8-inch round cakes, which is covered by one box of Duncan Hines Red Velvet cake mix. Once the cakes are baked and cooled, it’s simply a matter of frosting and assembling. Easy peasy! First, you’ll add just a dab of your frosting to the center of your cake stand. This helps keep the bottom layer in place. Next, place one of the cake layers onto the cake stand with the flat side on the stand. Add a big dollop of frosting on top of the bottom layer (about 1 cup) and spread the frosting evenly over the top of the cake out to the edge. You can have a slight bit of overhand of frosting, which will help when icing the sides of the cake. Next, place the second layer of cake onto the frosting and gently press it down just to make sure it sticks. From here, frost a thin layer of frosting all of the cake, top and sides. This will help seal in the crumbs, also known as a crumb coat. Once you have your crumb coat, begin to frost the cake from the top then down the sides. Be generous with your frosting, continuing to smooth as you go around the cake. Once your cake is fully covered, you can then go back and add in textures and swirls, whatever you’d prefer. Like I mentioned before, this cake isn’t a perfectly smoothed cake so make it your own! 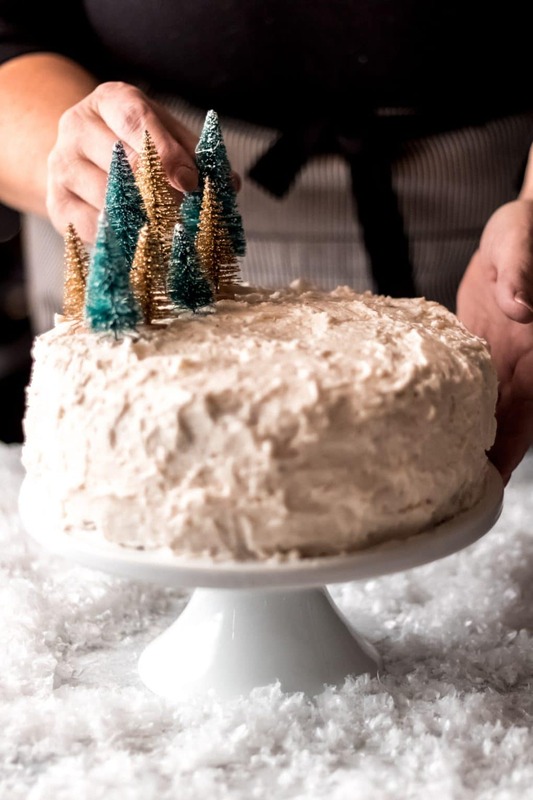 If you’re baking this cake for the holidays, get festive with your decorations. I added a few miniature bottle brush trees giving it a classic holiday feel. I’ve also added red sugars or gold sprinkles. 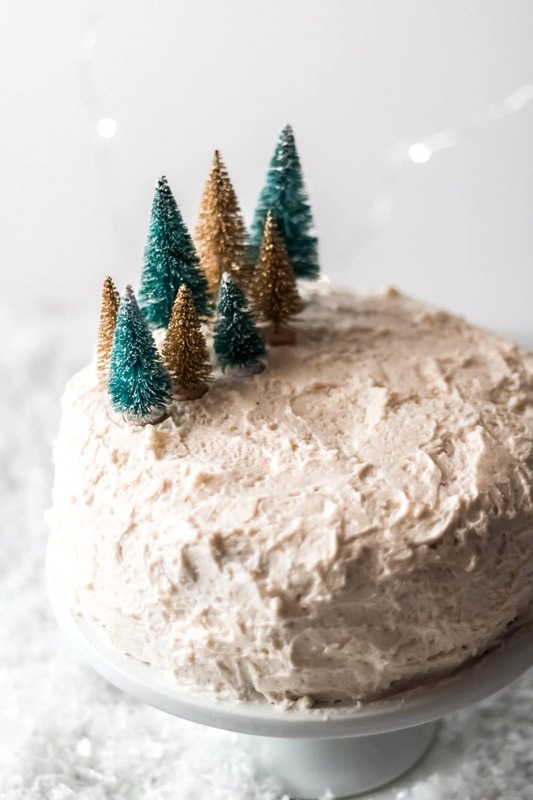 It’s such a gorgeous cake for the holiday season, get festive! 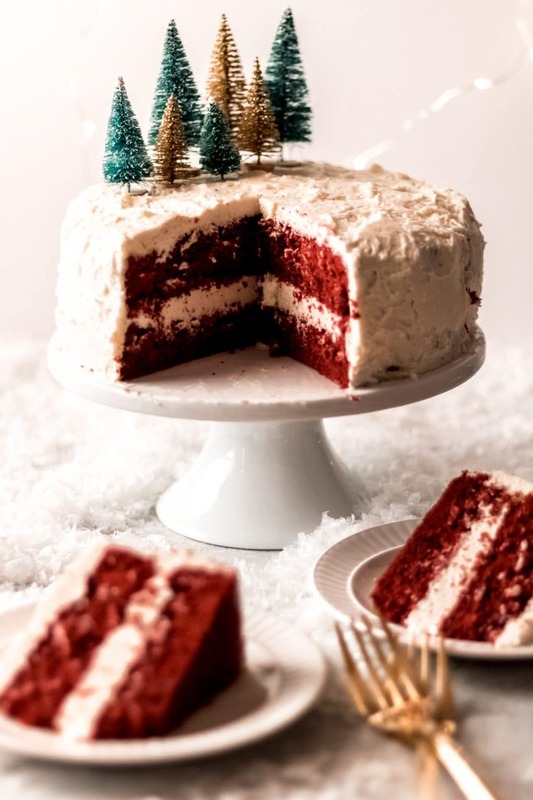 Enjoy this classic American cake, red velvet with butter roux frosting, this holiday season! A childhood favorite, this red velvet cake with butter roux frosting is like no other red velvet cake. Also known as Waldorf-Astoria red velvet, it’s the butter roux frosting that sets it above its cream cheese counterpart. In the top pan of a double boiler, combine the flour and milk and whisk until smooth. Cook over boiling water, stirring frequently until the mixture is thick and custard-like. Cover immediately with plastic wrap, pushing the wrap down to cover the top layer of the mixture to prevent a top film from forming. Let cool completely. Bake cake mix per box directions for two 8-inch round cakes. Once finished baking, let cool for 15 minutes, then transfer to a cooling rack to finish cooling. While the cakes are cooling, begin to make the butter roux frosting. Make sure the roux is completely cooled. In a large stand mixer bowl, cream the softened butter for 4 minutes on medium speed. Add the sugar and beat for 4 minutes on medium speed. Add the milk mixture and vanilla and beat for 4 minutes on medium speed. Refrigerate until you are ready to ice the cake. First, you’ll add just a dab of the frosting to the center of your cake stand. This helps keep the bottom layer in place. Next, place one of the cake layers onto the cake stand with the flat side on the stand. Add a big dollop of frosting on top of the bottom layer (about 1 cup) and spread the frosting evenly over the top of the cake out to the edge. You can have a slight bit of overhand of frosting, which will help when icing the sides of the cake.